In a Word document, a bookmark can refer to a location in the document or an actual block of text within the document. The GcWord API provides methods to access all the bookmarks in a Word document and allows you to alter its text. This article describes how you can implement a mail merge quickly and easily using bookmarks and a Word API. 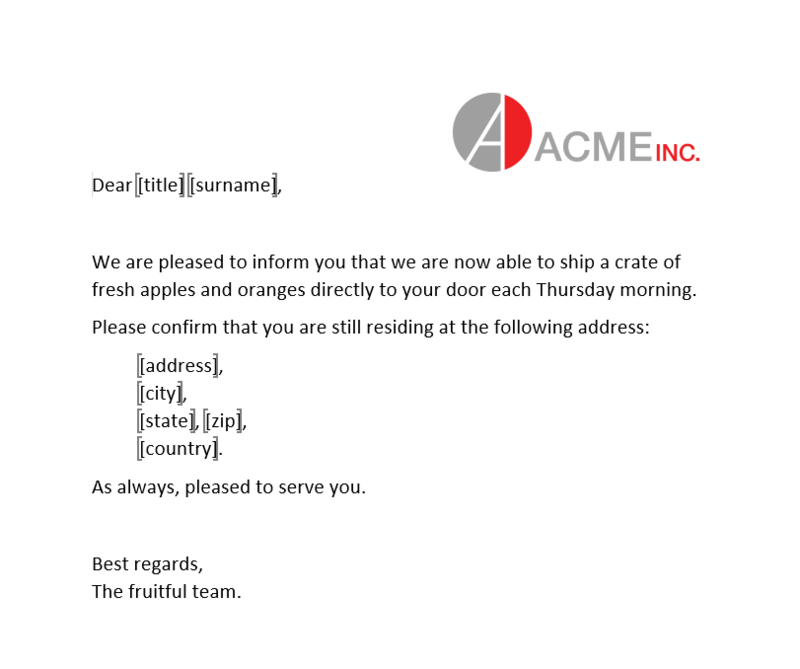 Consider a mail merge scenario, where a company wants to notify its customers about the dispatch of merchandise/products from their warehouse. In such a scenario, the content of the mail drafted for each customer would remain same, the only part that needs to be altered is each customer’s name and address. 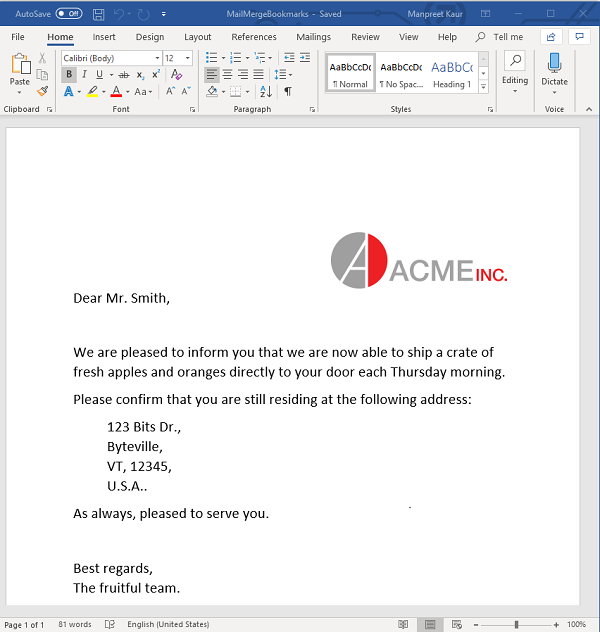 For this example, we’ll create a template document using MS Word. The parts of text that need to be replaced during the mail merge are represented using some placeholder text. For example, the sender, receiver, and receiver’s address are inserted using placeholder text. These placeholder texts will be marked as bookmarks so we can replace their text to generate new documents and implement a mail merge. We'll design a template document using MS Word, which contains the mail draft. We'll insert placeholder text for the "From, To, and Address" parts of the document text. These placeholder text in the document will be marked as bookmarks. In the above image, the name of each customer and the address will need to be replaced. This text is inserted as a bookmark. Using the GcWord API, you can load this document in code to access all the bookmarks. Replace the text of each bookmark with an appropriate value to generate the new document. The bookmarks collection in the document can be accessed using the Bookmarks property. // Replace bookmarks with actual data. // Method to replace a bookmarked text with a specified value. The newly generated document can be saved using the Save method of the GcWordDocument class. Did you find this feature interesting? If you have any questions, please leave a comment below. A Senior Software Engineer ay GrapeCity, Manpreet Kaur has been in the software industry for over 7 years. She likes working with trending and latest technologies. In her spare time, she enjoys cinema, cooking, and traveling. 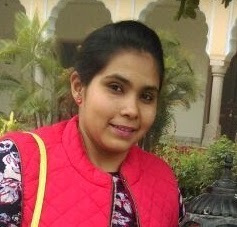 She has a B.Sc(H) in Computer Science from Deen Dayal Upadhayaya College/Delhi University and a MCA - M.E.R.I/Guru Gobind Singh Indraprastha University.